I have yet to fully complete an xMOOC, but I certainly could see it as valuable. This one looks particularly good and I’m betting it could be a great experience. I think, if I were to take it, it’d be much like a cMOOC – dive in and out and take what I need – but, they’re certainly set up much more around consumption models. I wish you success with it, and I hope you will blog about it with #etmooc. Thanks very much for this very thoughtful and detailed post! Thanks so much for your thoughts. I am planning on blogging about the HarvardX class. I expect I will press to finish, if my employer is going to give me credit after all. Still, if it ends up being a more cMOOC-like experience I will be all the happier. Considering it is free, if I can complete everything it will be a total bonus. I’m starting my first xMOOC too…Coursera’s eLearning & Digital Cultures. I will say the instructors are relatively networked and have made a real effort in the pre-course weeks to encourage people TO connect…so we will see. While we’ve been swamped under with flu for two weeks and my actual contributions to #etmooc have been sadly minimal, I’ve been reading and watching, and am interested to see if #edcMOOC actually feels terribly different. I wish you much luck on the xMOOC experience. The class sounds so cool, although I think the instructors will likely be the biggest determiner on that. Seeing that University of Edinburgh is source, I must admit I am intrigued. Will you be chronicling this adventure? I would love to read about it. Feel better and thanks for the thoughts. This is a great post Fred and I agree with your concerns about the invisibility of cMoocs in the recent media hype. I too have signed up for a Coursera xMooc this week so will look forward to your ongoing comparative reflections. Thanks for the kind words. Interestingly, your use of the word “invisibility” is an intriguing one. Truth is the cMOOCs are invisible on the media front and yet they are so much more visible from a participation perspective. Many cMOOCs leave a legacy on the web that is accessible long after the course has finished. I have yet to hear of an xMOOC that operates similarly, although they may exist. Most of them seem to be all tucked behind the walls of some password protected LMS, which is not terribly Open and makes me question their MOOCiness. I’m about to take my very first xMOOC as well. Like you, I am eager to feel the difference between that and the cMOOC experience. Are xMOOCs the evil twin they are made out to be? I look forward to reading more of your posts. Unlike your rigorous entrance process, the Coursera registration for the course I’m taking was very open. I believe all who register are accepted. I agree. I’m in the process of documenting my cMOOC learning experiences to receive elective credit in a certificate program. Receiving the credential will be valuable, but far more valuable is the impact the cMOOC experience has had on my development as an educator. It has radically changed my practice and my options. Others have noticed. It’s given me enough confidence, and my colleagues enough confidence in me, to attempt the next step. I’m working to bring together a geographically separated group of colleagues as a cohort to take the Coursera xMOOC together. I’m proposing to enhance our learning by sharing together in an online discussion/study group. My colleagues see the xMOOC as a “real” course. I see the study group as an opportunity to introduce cMOOC-like experiences by stealth. The best success I could imagine would be to subvert our group to become part of a network as per Stephen Downes’ illustration. I wish you luck with the Coursera effort and think it is awesome that you are recruiting colleagues. My recruitment efforts have not yet really worked, although I am not as aggressive as I probably could be. There are couple of people in the school where I work that I think I can get to jump into the fray if the timing is right. It seems like we both see that similar bias, wherein the xMOOC is generally perceived as the real course. I certainly feel like that is often true, of course that presupposes that the person has even heard of the term MOOC, which is still not as well known as any of us engaged in them might think. Also, I really like how you framed your experience and development with cMOOCs in such a concise way. I am completely with you on your assessment. Thanks for the Illustration I don’t remember seeing that one but love it, especially how messy it looks. That could be the whiteboard in my classroom, actually. I look forward to readin how your experience is going. We can swap war stories. Totally envious! I wanted to take that course but am involved in #etmooc and #edcmooc with Coursera. Loved your post. I’m such a fan girl of Lessig, Fairey, Groom, and Levine! As a member of “History for Music Lovers” (based on parody)- people always ask me about copyright and fair use. I’m a bit rogue. Have you looked into the Gutenberg Parenthesis? I know what you mean about being a fan of those people. They are all what I think of as the Digiterati, particularly of the edtech variety. By the way, I think a lot of us are a bit rogue on the copyright and fair use front, sometimes by choice. I suppose the trouble is too many people are just ignorant, also sometimes by choice. I just don’t like choosing that option generally. So, I am excited. I will try to share as much as I can. Thanks for the tip on Gutenberg Parenthesis, I hadn’t heard of it at all and already searching. I would imagine that you will take your cMOOC experiences with you and therefore enhance the instructional pedagogy of the xMOOC to the benefit of yourself and your cohort. It would be interesting to see if collaborative learning is encouraged, and if so how readily that is taken up by learners who are ‘instructed’ to work together. I think you are right. 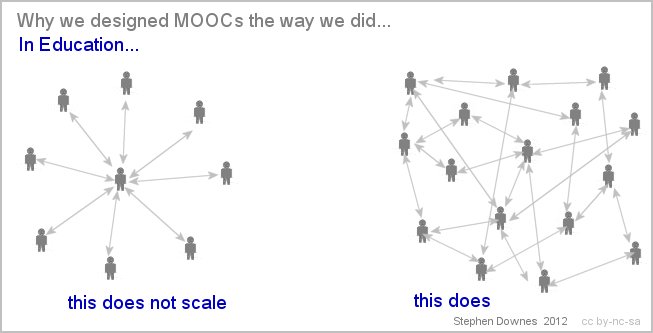 I am finding it hard to avoid the cMOOC approach from influencing a lot of what I do. In fact, I just wish I had the time to write more and share more stuff. I am working harder at finding the time and reminding myself that my experience might benefit others too, instead of feeling like most people wouldn’t be terribly interested in the same things as me. I am keen to see how if the course is collaborative or simply cooperative too. I am sure I will write about that in future. I enjoyed reading your blog and was able to take away some things to think about. I am new to blogging, MOOCing, and only considered copyright considerations as a result of an etmooc session. It will be interesting, for me, new to ALL of this to follow you and see where you land. Thanks for sharing so eloquently. Thank you for the kind words. Welcome to the blogging and MOOC communities. I am not sure that you could start with a better kind of experience than ETMOOC. As far as the MOOC movement goes, this one is as about as inviting and accessible as any I have ever seen or taken part. I wish you luck on both fronts. Be patient and kind to yourself. There will be ups and downs, and I think everyone goes through that period of wishing they shared more, wrote more, and staked a bigger space in the community more. Some of us might never leave that period or feeling. I am hoping that some of the copyright material will be useful to all. It is so misunderstood. At first glance things are already looking pretty lawyerly, but I am hoping to make my way through as best I can.